It has recently come to my attention that there are still SLPs out there relying so heavily on the developmental model of articulation that they do not even “entertain” the thought of working on certain sounds at certain ages. It’s as though, those particular sounds are considered sounds that “don’t have to be targeted yet” so they aren’t. 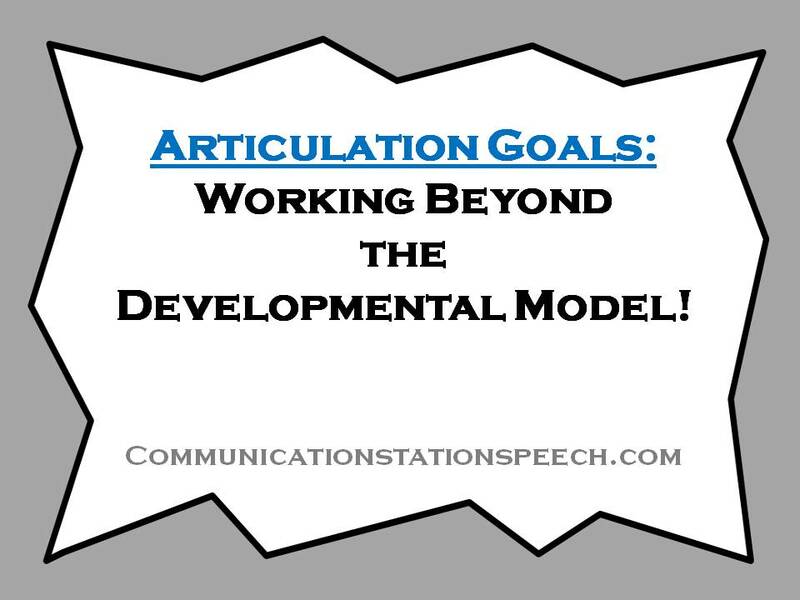 The developmental model of articulation is a great guideline for us as professionals to compare a child’s speech production to typical articulation. However, it is not the ONLY guideline nor should it be the only consideration to take into account when creating a treatment plan. To answer the first question that may be going through your mind, YES there is research behind the use of considerations other than the developmental model to determine appropriate treatment plans for articulation disorders/deficits. If we look at more recent research on successful treatment of CAS we see the recommendations of best practices go completely AGAINST the developmental model at this time and highly encourage the use of current high frequency sounds and sound combinations within the child’s phonemic inventory. If we look at the research supporting Hodson’s Cycles approach, we see that for highly unintelligible children who use phonological processes/patterns, the developmental model does not have such efficient and successful results as the use of this approach. These are only two examples of empirical evidence suggesting there are other considerations we should be taking into account when creating treatment plans. 1. Developmental Model: of course I use the developmental mostly as a resource to compare what sounds typically developing children my client’s age can produce vs. what my client can currently produce. This provides me with a picture of the delay or disorder. 2. Stimulability: Knowing which sounds and in which positions for which a child is stimulable, begins to provide a list of possible appropriate targets for treatment. Theoretically, the higher the stimulability, the higher the likelihood of success in speech production early on in therapy. 3. Emerging and High Frequency Sounds: I want to know what sounds are emerging and which sounds and sound combinations are produced correctly with high frequency. Maybe my client can say a sound in the medial and final position but substitutes it in the initial position. This sound may be a good sound to begin therapy as the child can already produce it in two word positions. 4. Effect on Intelligibility: This is one of the rules I personally follow most often. I like to target sounds that are salient in the English language. Sounds that are used often in speech production, are great sounds to target because if I can improve production of that sound, I can improve production in EVERY situation where that sound occurs, which of course improves intelligibility much faster than targeting a sound that is not used as often. I also like to choose sounds that are substituted by NON-developmental substitutions. These non-developmental sound substitutions (eg. /h/ for /s/) have a larger negative impact on intelligibility than a developmental sound substitution (eg. /t/ for /k/). Therefore, it would be more beneficial to reduce or eliminate the use of a non-developmental sound substitution as compared to developmental sound substitutions. 5. Parent goals: This is one area we sometimes forget as SLPs. We must ask parents what are their goals for their child and how can we help achieve those goals. I may not write a goal for “j” for my 3 year old client (as “j” really doesn’t have as large an impact on overall intelligibility as other sounds (/s, z, f/ etc.) may), but since my client’s parent wants him to say his name, “John”, I may write a goal for correct production of his name. This is a completely appropriate goal for my client, a PK student who feels frustrated when his friends cannot understand him when he says his name. So there are a number of other considerations we SHOULD be taking into account when assessing each child individually. There should never be a blanket type of treatment for children simply based on their age when there are so many other factors that can successfully or negatively impact speech production and intelligibility.